Southeastern Conference teams may not bother taking a spin on this year’s coaching carousel. While at least one coach has been fired already in each of the other Power Five conferences, the SEC doesn’t have any coach on the brink of being let go heading into the final weekend of the regular season. Barring a surprise move, 2019 would mark the first time since 2006 that the SEC begins a season with no new head coaches. The potential lack of coaching movement in the SEC doesn’t necessarily mean schools are getting more cautious about making changes. After all, five of the league’s 14 members had new coaches this year. The only SEC coaches who started their current jobs before 2016 are Alabama’s Nick Saban, Auburn’s Gus Malzahn, Kentucky’s Mark Stoops and Vanderbilt’s Derek Mason. Things had to settle down at some point just to give all these new coaches a chance to prove themselves. Various circumstances helped out some coaches whose jobs otherwise might have been in jeopardy. 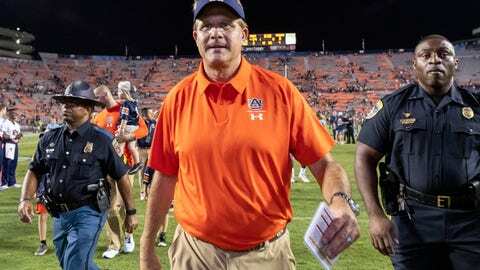 Auburn (7-4, 3-4 SEC) is out of the Top 25 after being ranked as high as seventh this year, but Malzahn is in the first year of a seven-year, $49 million deal and firing him would be costly. Malzahn’s buyout after this season would be $32 million. Both athletic director Allen Greene and Auburn President Steven Leath have said Malzahn will be back next season. Mason owns a 23-37 record in five seasons at Vanderbilt. The Commodores (5-6, 2-5) would earn their second bowl bid in three years with a victory over Tennessee this week but will clinch a fifth straight sub-.500 season with a loss. Although Vanderbilt is considered the toughest job in the SEC, Mason inherited a program that had posted back-to-back 9-4 records and Top 25 finishes under James Franklin. Mason still seems safe with Vanderbilt’s athletic department in transition. David Williams II announced in September he would step down as Vanderbilt’s athletic director once a replacement is hired. It would be rather unusual for a lame-duck athletic director to make a coaching change by removing a guy he’d hired. Senior quarterback Kyle Shurmur offered his support for Mason, who is seeking a third consecutive victory over Tennessee. The Commodores haven’t beaten Tennessee three straight times since the 1920s. Any questions about Missouri coach Barry Odom’s future likely were answered when the Tigers won their last three games to improve from 4-4 to 7-4. Odom has an 18-18 mark in three seasons. South Carolina (6-4, 4-4) is having a somewhat disappointing season, but Will Muschamp is 21-15 and headed to a third straight bowl appearance with a program that went 3-9 the year before his arrival. South Carolina gave Muschamp a new six-year, $28.2 million contract after the Gamecocks went 9-4 last season. Because most SEC positions are viewed as destination jobs, most coaching changes in this league come when someone gets fired rather than somebody leaving for a better opportunity. That said, Kentucky’s emergence this season could cause other Power Five athletic directors to check on the potential availability of Mark Stoops, who owns a 34-39 record in six seasons. A victory over Louisville on Saturday would give Kentucky (8-3, 5-3) its highest regular-season win total since a 10-1 finish in 1977. The Wildcats‘ seventh win this season added another year to the contract extension Stoops signed in March 2017 and makes it now run through June 2024. If Kentucky beats Louisville and also wins its bowl game to finish 10-3, Stoops would get a second year added to his contract extension. Although Kentucky’s persistence with Stoops through his early struggles paid off this season, Nutt doesn’t expect that to cause other SEC teams to become more patient with coaches. Nutt instead believes the likely lack of coaching changes this year virtually assures plenty of moves next season.